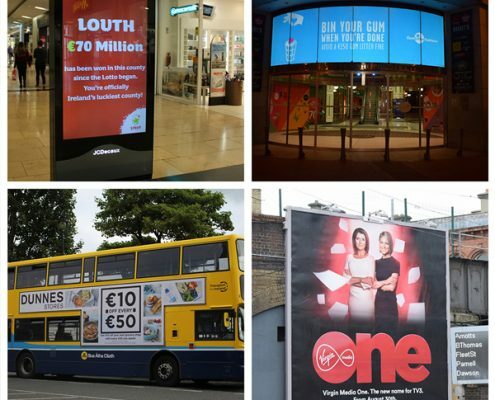 The Irish OOH market has grown by 4% in the year-to-date according to PML Group, ahead of the release of its third quarterly Posterwatch report for 2018. According to PML, Q3 campaigns that helped fuel this growth included TV3 Group’s rebrand to Virgin Media, the annual public awareness campaign for Gum Litter Taskforce, the relaunch of Lotto games and the continued investment by retailers such as Dunnes Stores which led to the retailer becoming one of the top 10 OOH advertisers in the year-to-date. Across 2018 as a whole, Finance, Retail and Beers are the top three spending categories says PML. A notable increase in the Soft Drink sector’s investment is driven by promotion of zero-sugar versions and healthier choices in the category. FMCG advertisers make up five of the top ten advertisers. These are Mondeléz, Mars, Coca Cola, PepsiCo and Lucozade Ribena Suntory. PML Group’s OOH market figures are based on its cyclical monitoring of the entire OOH market and are calculated using rate card display values.